I made two dives about a month ago. The first was to 90 feet/27 meters for 20 minutes, and the second was to 36 feet/11 meters for 35 minutes. I was well within my computer guidelines, we did not do a safety stop, and I may have had one slightly fast ascent. I was OK until about four days after the dive, when I noticed a sharp pain in my elbow. If I'm not using my arm, I don' t notice any pain at all. But if I rotate my forearm or bend my elbow, I still get a dull ache. Is there any way this could be related to my dives? If you were symptom-free for four full days, then it is unlikely that subsequent symptoms are related to decompression illness and your dive. The nitrogen you absorbed during your dives has to follow the physiology of basic gas laws - it cannot stay in the body tissues once the partial pressure of nitrogen in the ambient air we breathe drops down to sea-level pressures. Although nitrogen leaves the body in a much slower fashion than we take it on, it still must leave. After diving, you should be equilibrated to ambient nitrogen in 24 hours. 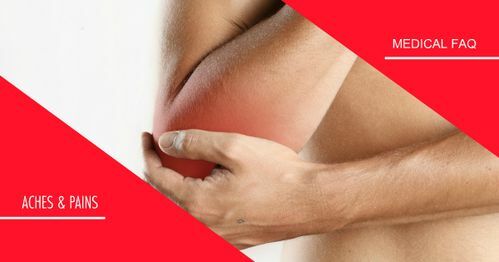 If the pain can be produced with movement of the affected joint only, then it is more than likely a musculoskeletal strain or injury. The pain generally associated with decompression illness is not affected by movement or lack of movement and usually remains fairly constant. The ability to reproduce the symptom with movement indicates a stress or repetitive movement injury. If you have not seen your personal physician it would be wise to do so. Any symptom of injury that persists for a month is a health concern. Appropriate therapy is indicated to prevent permanent injuries.